The increasing trend of the intensity and frequency of temperature and precipitation extremes during the past decades has substantial environmental and socioeconomic impacts. 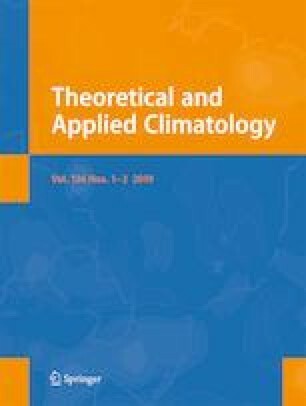 Thus, the objective of the present study is the comparison of several statistical methods of the extreme value theory (EVT) in order to identify which is the most appropriate to analyze the behavior of the extreme precipitation, and high and low temperature events, in the Mediterranean region. The extremes choice was made using both the block maxima and the peaks over threshold (POT) technique and as a consequence both the generalized extreme value (GEV) and generalized Pareto distributions (GPDs) were used to fit them. The results were compared, in order to select the most appropriate distribution for extremes characterization. Moreover, this study evaluates the maximum likelihood estimation, the L-moments and the Bayesian method, based on both graphical and statistical goodness-of-fit tests. It was revealed that the GPD can characterize accurately both precipitation and temperature extreme events. Additionally, GEV distribution with the Bayesian method is proven to be appropriate especially for the greatest values of extremes. Another important objective of this investigation was the estimation of the precipitation and temperature return levels for three return periods (50, 100, and 150 years) classifying the data into groups with similar characteristics. Finally, the return level values were estimated with both GEV and GPD and with the three different estimation methods, revealing that the selected method can affect the return level values for both the parameter of precipitation and temperature. The authors would like to thank Dr. Christopher Simmons for proofreading this article.